I needed a big piece of meat for the dog and this huge pork loin roast was on special so I picked it up. Also a young woman brought us some blackberries she had picked. It was already late afternoon so I salted, peppered and brushed the whole roast with olive oil. I put it on the BBQ off the burners so it would roast not sear. I put bay leaves and sprigs of rosemary and thyme on it. My BBQ has 4 burners so I can put the end ones on and roast in the middle. It works great and I'd buy another 4 burner BBQ just for that reason. The roast was just under 2kg so it took just over two hours for the thermometer to reach 170F internal temperature. Boiled new potatoes with salt and butter. The peas I blanched for one minute then cooled under running water. Emptied the water, added oil and started caramelizing a finely sliced onion. When the roast came off the BBQ I put it under foil to rest and put the peas in with the onions to finish cooking. The blackberries I ran through the juicer to get the seeds out. I took about half a cup of juice, 1/4 cup sugar and a pinch of salt. I reduced this to a thick sauce and tasted it. Tart but tasty. I put it on my pork instead of apple sauce. Fern wouldn't try the blackberry sauce. He missed out, it was fantastic! I tore up iceberg lettuce and chopped up a couple of tomatoes and two inches of cucumber. I took too much basil off the top of a plant and chopped that up. I put too much in the salad and it was a bit over powering. Olive oil, red wine vinegar, salt, pepper, 1/4 tsp dijon mustard and 1/2 tsp honey whisked up for dressing. 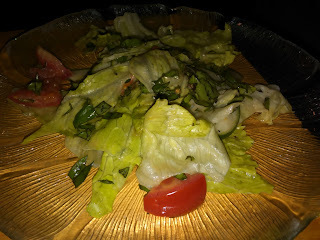 It was so hot the salad was limping out by the time I ate it but it was good. 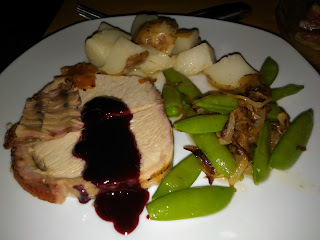 The roast was fantastic with the blackberry sauce. The peas were really good done that way too.